Our fleet of roll-on, roll-off skips is ideal for larger volumes of waste and can prove much more efficient and cost-effective for major jobs and substantial loads. 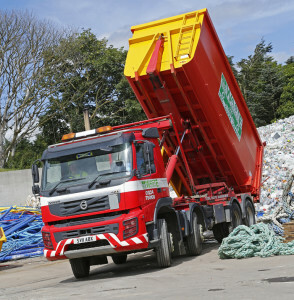 Customers of EIS Waste Services are impressed by the flexibility of what we can offer with a 24-hour, 7-day delivery service, including Bank Holidays, and the sort of personal attention you would expect from a family-run business with waste management experience dating back more than 40 years. You can choose your roll-on, roll-off skips from 20 yard to 40 yard capacity and enclosed bins are available for extra security or to contain hazardous waste materials to comply with Environment Agency regulations. We have a fleet of specialist delivery trucks and can usually offer a same-day service. Our skips are available for long or short-term hire and can be used for a wide range of materials including industrial and commercial waste, metal, plastic, wood, hazardous and inert. Where you need help in deciding the style and size of roll-on, roll-off for your specific job, we have experts on hand to give guidance and advice. We can also suggest the right choice to overcome access problems. We take pride in the satisfaction given to thousands of customers over many years when helping with a variety of waste management issues across a wide range of industries. The Ro-Ro service is one of the most extendable collection services for heavy or bulky waste and recyclables. Also available are compactor units which pack the waste into enclosed 40yd containers.